Our impact in the effort to preserve habitat and save wildlife is thanks entirely to people like you. When you click and view sponsor ads, purchase from our store, or make a direct donation to one of the many wonderful programs we highlight and support, you produce results like these. Thank you for your support to help protect wildlife habitat! The Himalayas are legendary mountains with their roots firmly planted in rich subtropical rainforests, and their snow-clad peaks touching the sky. This mountain range supports an astonishing number of ecosystems, from broadleaf forests to grasslands, rhododendron groves, and alpine meadows. But humans have encroached extensively, destroying much of this vital habitat in the name of agriculture, logging, and development. Rainforest Trust is working with GreaterGood.org to support a protected area to protect the plethora of species that live in the remaining untouched spaces. What kinds of creatures are helped by this reserve? An incredible array of flora and fauna are packed into this space, including the endangered Red Panda. Prior to joining Rainforest Trust, Bhakti Hang Limbu knew nothing about the red panda or conservation. He lived adjacent to the red panda habitat in Phurumbu, Taplegung, but at that time, was simply involved in agriculture and raising cattle. In 2014, Mr. Limbu got the chance to participate in an awareness workshop. From that point forward, he was engaged in the conservation of the red panda, and took on the role of a forest guardian. 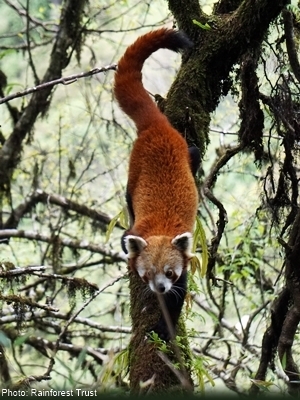 In 2015, Mr. Limbu saw his first red panda in the wild. It was a very rainy day, and it took him two hours to reach his post in the forest. He took cover from the rain under a tree, and saw a small, reddish animal. He realized it was a beautiful red panda cub! Mr. Limbu said, "the only thing that sticks [in] my mind was [how] I've [got] to protect this endangered animal. From that point onwards, monitoring [the] red panda has been my work of interest, [not just] a job." Mr. Limbu has an excellent understanding of the red panda and its habitat. He can detect poaching activities and inspires conservation awareness among local people. If he notices any threats to the red panda (or any wildlife in the area), he immediately informs the community forest officials of the district forest office. Working as a forest guardian has transformed Mr. Limbu into a more skilled and respected person in society. He now has the capacity, knowledge, and authority to protect the red panda in the Red Panda Community Forest. Do more to help Rainforest Trust, and other programs supported by GreaterGood and The Rainforest Site! GreaterGood.org's signature program, Madrean Discovery Expeditions, is tasked to explore, study, and protect the Madrean Archipelago. Hidden among the mountains, this series of unique ecosystems serves as an important wildlife refuge and corridor. The archipelago ranges from Arizona south, meeting the Sierra Madre Occidental in Sonora, Mexico. Inland "Sky Islands" rise from lowland tropics and desert "seas." Animals and plants from six different Norh American regions merge in this area, contributing to the phenomenal biodiversity. MDE funds and supports major expeditions to document the species in the Sonoran Sky Islands. What do biodiversity expeditions accomplish? We need to know about the animals and plants that live in these spectacular natural areas to bring communities together to protect them. For me, visiting new places, observing animals and plants in beautiful pristine habitats, discovering species, and sharing all of it with fellow biologists and the public in general really enriches my life. The Madrean Discovery Expeditions Program provides continuous opportunities do all of this. The expedition to Sierra Cucurpe in March 2018 was a wonderful surprise. It's a small mountain range on the edge of the Sonoran Desert, but there are two big rocky canyons with cottonwood-willow riparian forests full of water, with endangered native fishes. There were 48 participants, more than half from Mexico. Especially inspiring were the college students from two Sonoran universities. The expeditions are truly wonderful international gatherings. Do more to help our Madrean Discovery Expeditions program, and other programs supported by GreaterGood and The Rainforest Site! Jaguars were once top predators of the Sonoran Desert, which stretches across Mexico and into southern Arizona and California. They are extraordinary creatures, with beautiful camouflaged coats and the strongest bite of any wildcat species. But their number has been reduced by hunting and human encroachment to the point where the number of jaguars in the U.S. can be counted on one hand, and they are uncommon even in the adjacent part of Mexico. How can we help jaguars? By monitoring and protecting viable habitat, we might be able to keep this incredible wildcat from disappearing from our country forever. Today, there are few jaguars roaming the Sonoran Desert, and their habitat is fractured by ranching, urban encroachment, and barriers like highways. We can combat this fragmentation by protecting habitat, and importantly by creating and supporting wildlife corridors connecting protected wildlife areas. To sustain a population, we need to ensure that these big cats can travel through corridors like these to live, hunt, and breed naturally. In the last year, working in partnership with Primero Conservation, Project Wildcat has created and is adding to a vital wildlife corridor in the area. The corridor ranges across 34,6000 acres, and supports a plethora of other species. Moreover, Project Wildcat is working with ranchers to protect their livestock in ways that don't harm jaguar populations. They're working to make this a point of pride for participating ranchers in the hope of passing the commitment to live and work alongside wildlife to future generations. Do more to help Project Wildcat, and other programs supported by GreaterGood and The Rainforest Site!